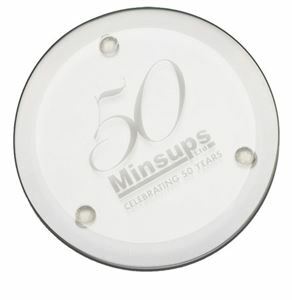 At Impact Trophies & Medals, we offer a great range of glass coasters suited to any business place, home or club. Our extensive range includes engraved jade glass coasters, crystal coasters and glass coaster sets with personalised engraving. Impact Trophies & Medals are a leading retailer of engraved glass coasters. Great for personalisation, many of our crystal coasters and engraved jade glass coasters can be personalised with high quality text and logo engraving, to perfectly meet all your business or gift presentation needs. The Jade Glass Square Coaster is a premium jade glass coaster with a square face and gentle bevelled edges. 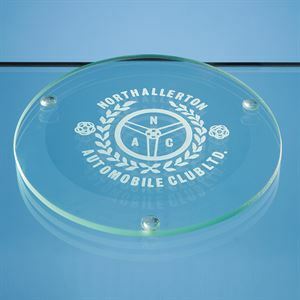 Set on 4 small feet (one in each corner) this superb glass coaster protects surfaces from heat and marks, whilst displaying your choice of text and logo engraved personalisation. Perfect for a home tabletop or corporate boardroom. 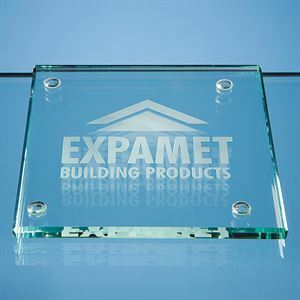 The Jade Glass Square Coaster can be purchased with or without personalised high quality engraving. The Jade Glass Round Coaster is a superior quality coaster made from high quality Jade Glass. Set on 3 small risers, the circular faces coaster has a large bevelled edge, giving this simple coaster a premium finish. The centre of the coaster can be engraved to display your choice of text and logo personalisation, making this the perfect boardroom or office accessory. The Jade Glass Round Coaster can be purchased with or without personalised high quality engraving. The Onyx Black Square Coaster is a standout onyx black glass coaster with a square shaped design. Each corner of the Onyx Black Square Coaster is held by a small foot perfect for protecting any tabletop from glasses and mugs. The square face of the Onyx Black Square Coaster can be engraved to display your choice of text and logo engraving, making this the perfect personalised gift or corporate desktop accessory. The Onyx Black Square Coaster can be purchased with or without personalised high quality engraving. The Sapphire Blue Square Coaster is a beautiful and vibrant glass coaster with a blue face. Available as a vibrant standalone piece or with your choice of high quality engraved personalisation, the Sapphire Blue Square Coaster would look perfect set on any desk or table top. 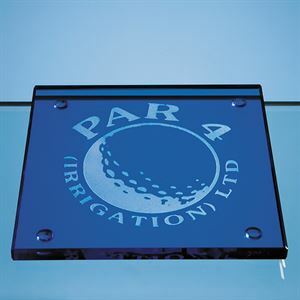 The square face of the engraved coaster can display any logo, message or text required, to perfectly match your needs and the coaster is supplied in a free presentation box, making it perfect as a gift. The Sapphire Blue Square Coaster can be purchased with or without personalised high quality engraving. Perfect for a small office or as a household accessory, the 4 Jade Glass Square Coasters in a Gift Box is a set of 4 square jade glass coasters with optional personalisation. 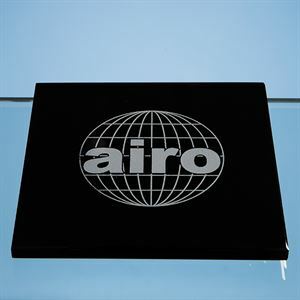 The perfect storage solution and display box for coaster, the square faced coasters can be engraved to display your choice of text and logo engraving, making them perfect for corporate use or as a personalised gift. 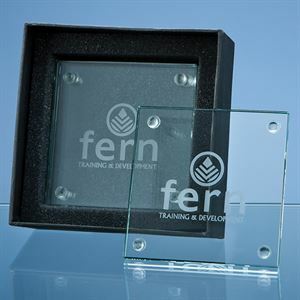 The 4 Jade Glass Square Coasters in a Gift Box can be purchased with or without personalised high quality engraving.